There is nothing better than a delicious, decadent dessert for St. Patrick’s Day. The flavor of mint runs rampant, which is a-okay in my book because it holds me off until my Girl Scout Cookies come in. Plus, I’m definitely partial to rainbows as you’ve seen in my Lucky Charm Cupcakes. 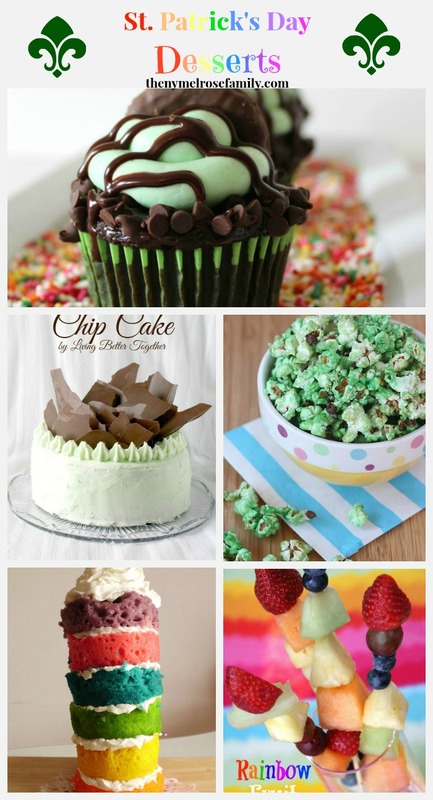 These St. Patrick’s Day Desserts are going to have you going pinning happy! If you’re still looking for my St. Patrick’s Day ideas be sure to check my Luck O’ the Irish Board on Pinterest and be sure to follow along! Follow Jenny Russell Melrose from The NY Melrose Family’s board Luck O’ the Irish on Pinterest. All of these St. Patrick’s Day desserts look so delicious. I pinned them. I love the collage. I found you on Ahalogy and scheduled several of your posts. YUM! Those lime and coconut cupcakes are calling my name. Thanks for the wonderful round up. Pinning! Jenny, thanks so much for including my fruit skewers. These desserts look fantastic! Definitely pinning and sharing this round-up! My kids would love the rainbow mug cake 🙂 I bet this will be fun to do for them. Thanks for linking these up Jenny! They look soooo gooood! Hi Jenny! These desserts all look wonderful! Thank you so much for sharing at Best of the Weekend – hope you have a happy Sunday and a fabulous week!